The PL-15 is a 5-port hub for connecting devices in a K-NET network. The unit supplies power and 2-way communication between up to five devices on a single cable. The PL-50 is a power controller that monitors and controls up to five power channels by detecting the power status of the connected units. Using an embedded Web server, the unit can schedule outlet activity and manage alarm response. The RC-10TB is a remote one-button contact closure switch, ideal for remote control in boardrooms and conference rooms. It can be used with the SID-X1N step-in commander or any other Kramer product with contact closure control. The RC-11TB is a remote 1-button momentary contact closure switch ideal for remote control in boardrooms and conference rooms. 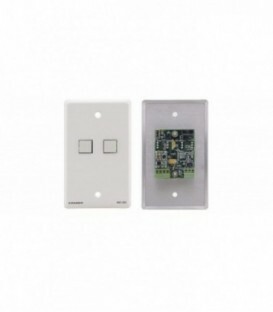 It is a single slot wall plate insert that can be used with the SID-X1N step-in commander or any other Kramer product with contact closure control. The RC-2 is a 2-button controller that sends a series of RS-232 commands with the push of a button. It operates serial devices such as projectors, displays & switchers. The RC-20TB is a two-button remote contact closure switcher. The wall plate insert can be used with the VP-81SIDN step-in switcher or any other Kramer product with momentary contact closure control. The RC-21TB is a remote 2-button momentary contact closure switch. The wall plate insert can be used with the VP-81SIDN step-in switcher or any other Kramer product with momentary contact closure control. The RC-2C is a 2-button controller that sends a series of RS-232 or IR commands with the push of a button. It operates serial or IR-controlled devices such as projectors, displays, and switchers. The RC-52A is a 6-button room controller with an analog volume control for multimedia rooms. It controls audio/video components and other room facilities such as lights and screens. The RC-54DL is a 12-button auxiliary control panel that works as a remote control panel for master room controllers such as the RC-74DL in classrooms, boardrooms or auditoriums. The RC-5B2 is an 2-button auxiliary control panel with backlit RGB buttons. It can be used as an auxiliary controller when connected via K-NET to a master room controller (such as the RC-74DL). The RC-5B4 is a 4-button auxiliary control panel with backlit RGB buttons. It can be used as an auxiliary controller when connected via K-NET to a master room controller (such as the RC-74DL). The RC-62 is a 6-button room controller for multimedia rooms. The unit can function either as a standalone controller or as part of the SummitView system to control audio components, video components and other room facilities such as lights and screens. The RC-63AL is a 6-button room controller with an analog volume knob for multimedia rooms. The unit functions either as a standalone controller or as part of the SummitView system to control audio components, video components and other room facilities such as lights and screens. The RC-63DLN is a 6-button room controller with a digital volume knob for multimedia rooms. The unit can function either as a standalone controller or as part of a more complex K-NET room control system to control audio components, video components and other room facilities such as lights and screens. The RC-712M is a twelve-button configurable room controller for multimedia rooms. It controls audio components, video components and other room facilities such as lights and screens. It is compatible with Merten System M.
The RC-76M is a six-button configurable room controller for multimedia rooms. It controls audio components, video components and other room facilities such as lights and screens. It is compatible with Merten System M.
The RC-76R is a six-button configurable room controller for multimedia rooms. It controls audio components, video components and other room facilities such as lights and screens. The RC-78R is an eight-button configurable room controller for multimedia rooms. It controls audio components, video components and other room facilities such as lights and screens. The SL-10 is a master room controller. It controls audio components, video components and other room facilities such as lights and screens. The SL-1N is a master room controller. It controls audio and video components and other room facilities such as lights and screens. The RC-43SL is a touch-sensitive 6-button control keypad. Connected over Ethernet to Site-CTRL remote AV control, site management & monitoring system, as well as LAN-connected control gateways for extended controlled devices capacity. The RC-43T is a touch-sensitive 6-button auxiliary keypad. 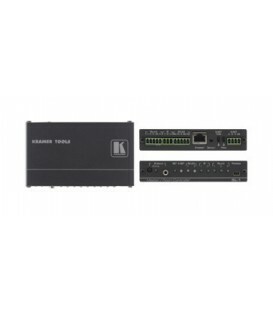 Connected over KNET to master control keypad such as RC-43SL, RC-74DL, or SL-1N, the RC-43T is ideal for serving as remote secondary keypad in classrooms, boardrooms or auditoriums, for convenient control of their multimedia devices.